Last week during a training session I asked my client what he had eaten that day. Specifically, I wanted to know what he had for protein. He immediately responds with “I had a Starbucks latté…” then seems to shrug off everything else as incomparable. Honestly, I tell myself that these responses are attempts to delay the impending workout because they require me to rant about food. That also helps to convince me I am not terrible at my job. I actually laughed off the conversation a little because that client is a huge success story of mine. Yes there is milk in a latté, and yes there is protein in milk. I will acknowledge that and move on. However, I may have to rethink my self- consolation now, because it seems another one of my clients follows the same dietary plan. My client, M, comes strolling in almost 10 minutes late for a session with a big smile on his face and one hand rubbing his Buddha belly. I asked him why he was late and he said “Oh sorry, the line at Tim Hortons was really long”. M is still wiping his face as he starts warming up and of course I have to ask him what he ate. With a big smile he tells me he “crushed” a chicken sandwich, a ten pack of Timbits (for all you non-Canadians, these are heavenly little bite sized cakes) followed by TWO extra large coffees with two creams and four sugars each. Let me put my disgusted facial expression into facts. 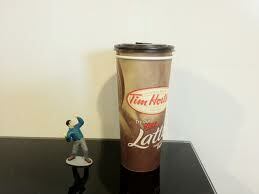 These two extra large coffees alone contain 48 oz of coffee which is about 480 mg of caffeine. Health Canada recommends no more than 400 mg in one day and any more than this can result in insomnia, nervousness, elevated heart rate, muscle tremors, and irritability. He pretty much maxed out how much his liquid bladder can hold and how much stress his heart can take then came to workout. I spent the whole hour expecting to see this whole meal again. I would have been happier if it had come up, really. I am a good Tim Horton- loving Canadian and I have also been guilty of overindulging, except my version doesn’t make a dent in this “light, pre- workout meal”. The first exercise we did, M says “watch this” and with each rep he would yell “one Timbit, two Timbits, three Timbits” until he had “burned off” all ten. He followed up with “this set brought to you by Tim Hortons”. As we go on to the next exercise, he informs me that we will be burning off the chicken sandwich next. This was all scientifically based on the order the food was eaten, of course. I spent the rest of our workout trying to convince him that he hadn’t burned off that meal, while he tried to convince me that he effectively covered all the food groups. Let me add the disclaimer that M has lost about 60 pounds so far and has about 60 to go. A few hours later I receive this text: “I just saw a fitness ad that says would have to do 20,000 sit-ups to lose 1 pound of belly fat. 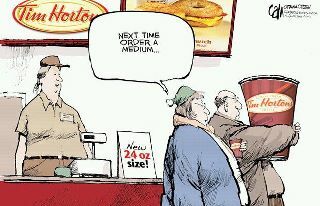 Thanks a lot Tim Hortons”. Lessons to be learned: There is indeed too much of a good thing. Size matters. Listen to your trainer. In the end, you can’t out train a bad diet.